Bridal Hair & Make-up Trial Event at Bridal Styles Boutique! Wish you could see how your hair, makeup and headpiece will work all together before your wedding day? Don’t miss our event this Monday, March 11! After collaborating on many photo shoots, Bridal Styles Boutique is teaming up with the talented women at La Sorella Bridal hair and makeup studio for a special day of bridal beauty! 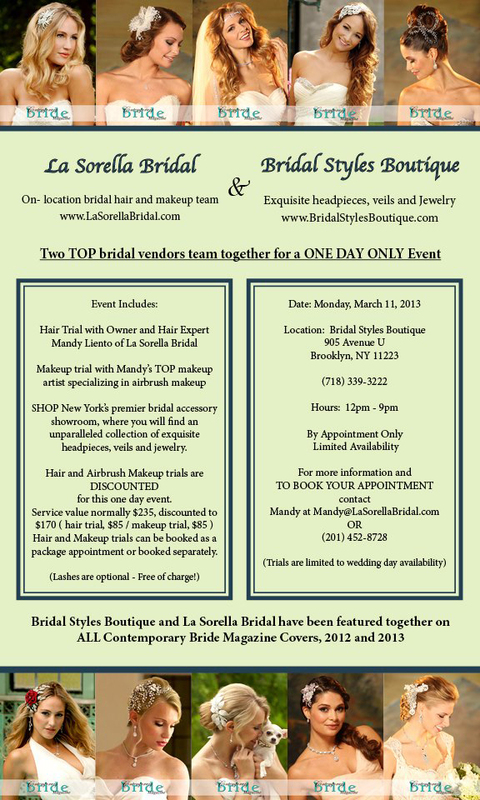 For one day only, La Sorella’s fabulous hair and makeup team will be at Bridal Styles Boutique for full hair and makeup trials at a discounted rate with our vast collection of bridal headpieces, veils and jewelry at your fingertips. It’s the perfect chance to see the way your headpiece, hair and makeup will look all together! Limited space is available, so be sure to schedule your appointment as soon as possible by calling 201-452-8728, or emailing Mandy@LaSorellaBridal.com. This entry was posted on Tuesday, March 5th, 2013 at 8:27 am	and is filed under Announcements, Blog. You can follow any responses to this entry through the RSS 2.0 feed. You can skip to the end and leave a response. Pinging is currently not allowed.